Two U.S. Navy warships transited the Taiwan Strait on Nov. 28, on the eve of a meeting between President Donald Trump and Chinese supreme leader Xi Jinping at the G20 summit in Buenos Aires. 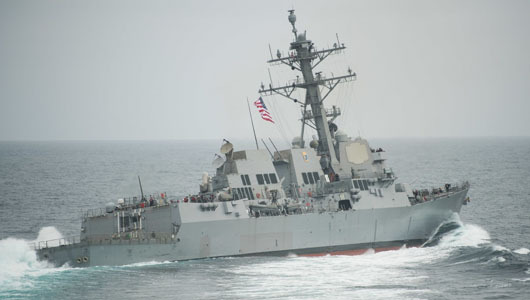 The Arleigh Burke-class guided-missile destroyer USS Stockdale, accompanied by the Henry J. Kaiser-class underway replenishment oiler USNS Pecos, transited the strait between mainland China and Taiwan, U.S. Pacific Fleet told Business Insider in an emailed statement. Trump and Xi will meet over dinner on Dec. 1 in Buenos Aires. Trump is hopeful for a breakthrough with Xi but is ready to impose more tariffs if the upcoming talks don’t yield progress, Larry Kudlow, Trump’s top economic adviser, told reporters on Nov. 27 during a briefing ahead of the G20 meeting in Argentina. The president believes “there is a good possibility that we can make a deal” and he “is open to it,” Kudlow said. Last month, The U.S. Navy sent two warships – the destroyer USS Curtis Wilbur and the cruiser USS Antietam – through the strait. In September, a U.S. Navy destroyer conducted a freedom-of-navigation operation near the contested Spratly Islands, where it was challenged by a Chinese warship that forced the American vessel off course. In July, the destroyers USS Mustin and USS Benfold sailed between mainland China and Taiwan. The U.S. Air Force in recent months has been sending B-52 bombers over the South China Sea.